What It’s About: Jewish nobleman Judah Ben-Hur (Charlton Heston) is falsely convicted of an assassination attempt on a Roman officer and sentenced to the galleys. Escaping a slave’s death through his wits, honor, and athleticism, he seeks revenge on those who have wronged him while also trying to locate his lost family. He serendipitously crosses paths with Jesus Christ and finds his life forever changed. Based on Lew. Wallace’s 1880 book, one of the best-selling American novels of all time. Why Watch it Today? : April 21, 753 B.C. is the traditional date of the founding of Rome, so why not celebrate with one of the most Academy-decorated films set in ancient Rome? Ben-Hur abounds in Roman pageantry, with thrilling naval battles and chariot races, generals in full regalia, exotic imperial locations and all the epic pomp that would inspire Monty Python’s classic parody Life of Brian. 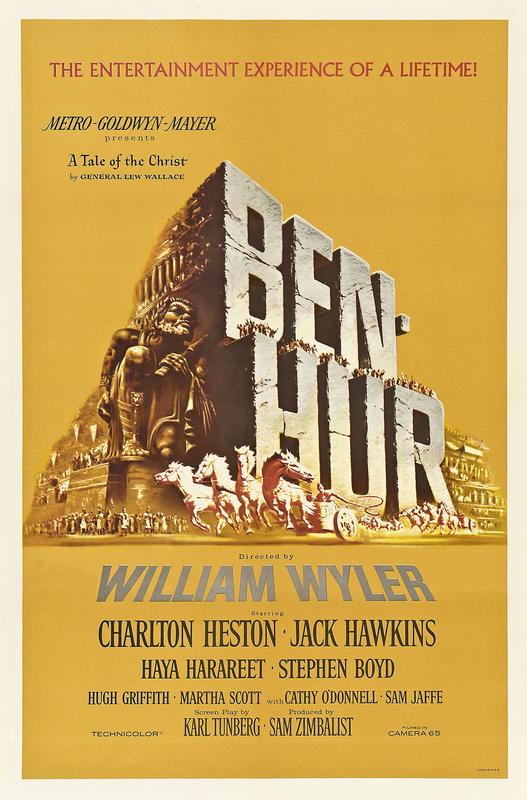 Ben-Hur might not be the most classical of Roman movies, because of the Christian themes, but on the day after Easter this is a good seasonal choice. Other Ways to Mark the Founding of Rome: If you don’t feel like watching a movie, you could: stab Caesar; learn about Roman numerals; watch a play; sign up for a summer course in spoken Latin in Kentucky, Boston or Rome; or experience the craziness of the craziest of Roman emperors. This entry was posted in Action, Adaptation, Adventure, Based on a Book, Biblical Epic, Drama, Epic, Movie of the Day, Naval, Period Film, Revenge, Sword and Sandals and tagged Best Actor, Best Art Direction-Set Decoration, Best Cinematography, Best Costume Design, Best Director, Best Effects-Best Special Effects, Best Film Editing, Best Music Scoring of a Dramatic or Comedy Picture, Best Picture, Best Sound, Best Supporting Actor, best writing nominee adapted screenplay, chariot race, Charlton Heston, galley slave, Jesus, leper colony, Rome, William Wyler.